← Is Luis Enrique Bad At Managing Big Games? The big matchup in Ligue 1 this week was Marseille traveling to Lyon. The away match was the toughest test of the season for Marcelo Bielsa’s men. They failed in a 1-0 loss. Yoann Gourcuff followed up his brace last week with the match’s only goal. WhoScored awarded man of the match to Lyon’s keeper, Anthony Lopes. He only made four saves, but they were all pivotal to securing the win for Lyon. Lyon is now undefeated in their last six matches. Andre Ayew received a yellow card, which means he will miss Marseille’s huge fixture at PSG on November 11th. With PSG winning, Marseille’s first place lead is now four points. PSG and Bordeaux entered their fixture in Paris level on points with 18, second and third in the table. PSG is still second, but Bordeaux dropped down to 6th after PSG’s 3-0 win. Lucas Moura was the star of the match. He scored twice (albeit both penalties) and completed five dribbles. The match also marked the return of the beloved Policeman Lavezzi, who scored in his first appearance since late September. Nice shellacked Guingamp, 7-2. Five of Nice’s goals came from one man: Carlos Eduardo, pictured above. (No, not the only who plays for Rubin Kazan.) 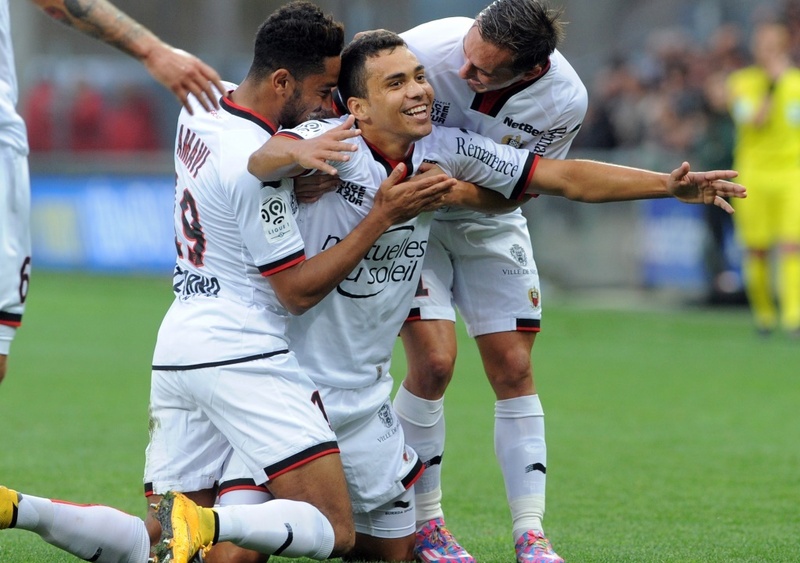 Alassane Pléa had a goal and two assists as well for Nice, but was understandably overshadowed in the match. Guingamp was currently last in Ligue 1 and with a performance like that, it’s very easy to see why. Lille’s run of bad form continued, losing 2-0 at Rennes. Lille has only take four points out of a possible 18 from their last six games, is on a three game losing streak, and has scored a whopping total of two goals in this six game span. Don’t look now, but Monaco is three points away from a third place. After stumbling out of the blocks, the men from the principality have gotten it together. They beat Claude Makelele’s Bastia 3-1, with Yannick Ferreira-Carrasco having a part in all three goals. Monaco has the third best form in Ligue 1 over the last six games, with only one loss. This entry was posted in Ligue 1, Roundups and tagged ligue 1, Marcelo Bielsa, Monaco, Paris Saint-Germain. Bookmark the permalink.